Through the promotion of arts, English, science, and education the British Council works on high-profile international festivals and seasons, introducing people around the world to the best of UK culture and innovation, and has now offered an update on recent and planned activities. We create new opportunities for artists and organisations to work internationally. For more information on how to get involved with any of our current or future seasons please get in touch. UK/Italy 2020: The UK/Italy Season is an exciting opportunity to strengthen and build new cultural connections between Italy and the UK in the autumn of 2020. A season of culture is planned in both countries. As the UK leaves the EU, cultural relations will play an increasingly important role. UK/Japan season of culture 2019-2020: Announced in August 2017 by Prime Ministers May and Abe during the former’s visit to Tokyo, a major season of culture will take place in Japan between autumn 2019 (Rugby World Cup) and summer 2020 (Olympics and Paralympics). The British Council, working together with the Foreign & Commonwealth Office, Department for International Trade, the Department for Digital, Culture, Media & Sport and other partners, will lead the activities in Japan. At the same time, the Japanese government will lead on Japanese activities in the UK. 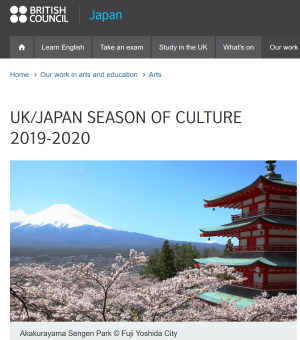 We aim to promote the UK as an attractive destination in which to invest, to study and to travel and to build greater levels of trust between Japan and the UK through the arts and the creative industries. UK/Georgia 2019: New Cultural Horizons: The UK/Georgia 2019 is our programme of events and activities which will run from September – December 2019 to celebrate the cultural connections between both countries. The UK/Georgia 2019: New Cultural Horizons aims to reach new audiences, broaden horizons and foster cultural exchange and the flow of ideas. UK/Germany 2018 season: A dynamic, year-long programme exploring and celebrating cultural connections between the UK and Germany. The annual British Council Literature Seminar in Germany has been presenting eminent UK writers and new literary voices for over 30 years. UK/Indonesia 2016-18: is a three year programme that has been building new links between young creatives and build awareness of contemporary arts in two of the world’s most exciting countries. This programme is culminating in a month long series of events this October and November. Read our stories and find out more below.